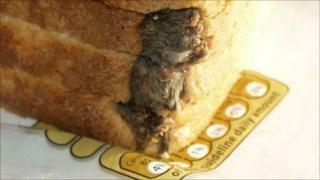 A food production company was ordered to pay nearly £17,000 after a man found a dead mouse in a loaf of bread as he made sandwiches for his children. Stephen Forse, of Kidlington, Oxfordshire, had already used some slices when he came across the mouse. Mr Forse purchased the loaf online, through a Tesco branch in Bicester in January 2009. Premier Foods was fined £5,500 and ordered to pay £11,109.47 in costs at Oxford Crown Court. In July, the company, which makes Hovis bread, Branston pickle and Bisto gravy, admitted to having failed to maintain acceptable standards at its British Bakeries site in London. Mr Forse said he had already used some of the bread when he noticed "a dark-coloured object embedded in the corner of three or four slices". "Initially I thought it was where the dough had not mixed properly prior to baking," he said. "As I looked closer I saw that the object had fur on it." Mr Forse said he continued to prepare some sandwiches for his children and their friends from another loaf of bread. "I checked carefully each slice in turn as I felt quite shaken," he added. "As I was feeling ill I couldn't face eating anything myself. I sat with the children as they ate theirs." Mr Forse contacted Cherwell District Council and environmental health officers visited the family's home to collect evidence. During the visit one of them identified it as a mouse minus its tail. "Her comments made me feel ill once again as there was no indication as to where the tail was," added Mr Forse. "Had it fallen off prior to the bread being wrapped or had any of my family eaten it with another slice of bread on a previous day?" A spokesman for Premier Foods said: "We apologise profusely for the distress caused as a result of this isolated incident. "As soon as this complaint was made we stopped all bakery production at that site and appointed an independent specialist contractor to conduct a thorough investigation. "They confirmed this to be an isolated incident, affecting a single product. "There was no evidence of mice within the bakery and no history of any similar issues." The spokesman added that the council had agreed "the bakery was a well-managed site and that Premier Foods took its obligations for health and hygiene seriously".